With the help of VeryPDF Flipbook Maker, you can easily convert PowerPoint to flip book which can be viewed on your computer, iPad, iPhone, etc. different kinds of devices. This flipbook animation software can be used to convert multiple kinds of source file formats to flipbook document. 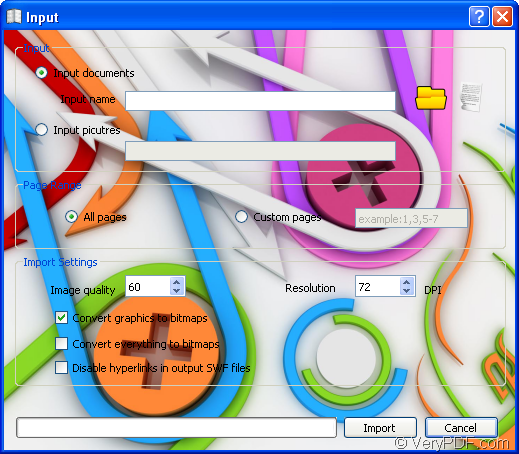 In the conversion process, you can also optimize the image in input file to reduce the size of created flipbook. In this article, you will see how to convert PPT to flipbook and in created flipbook you will see full flipping book animation. At first, please free download VeryPDF Flipbook Maker and then install it on the computer by following the setup wizard. When you are able to use the application, please launch it and input PowerPoint document into the application. After seeing the application interface like the one shown in next snapshot, please click the button Input to open Input window and then check Input document option to activate the function for inputting document. Please click the icon like a folder beside the edit box to open file picker window in which you are able to choose the PPT or PPTX document you want to convert. In Page Range group box, you can set the page range for input PowerPoint document. For example, you can convert all pages of PowerPoint to flipbook or several pages of PowerPoint to flipbook. In Import Settings group box, you are able to set the image settings for created flipbook. For example, you can set image resolution, change image quality, convert graphics to bitmaps, etc., Then please click Import button to upload PowerPoint document. Please see it in next snapshot. When you export the target file, please click Save button to open Save window in which you can save the converted flipbook as four file formats like .html, .exe, .zip and .app. So just choose one you need and then choose the output location in Output Folder edit box. You can also input the name for target file in File name edit box and at last please click Save button. Then you will be able to get flipbook successfully when you flip it on your devices, you will enjoy its excellent animations. If you are also interested in this flipbook maker, please click the following button to download the free trial version of it or you can visit the homepage of VeryPDF Flipbook Maker to see its detailed information. This entry was posted in Flipbook Maker and tagged PowerPoint to flip book. Bookmark the permalink.